The Moonflower is probably the most famous of all night blooming plants. Moonlight Gardens, or garden spaces that can be enjoyed best in the dusk and dark of evening, have become all the rage. They use a combination of traditional bright blooming plants and plant varieties that only reveal their blooms in the dark of night to create a magical scene. But even if you don’t want to go all out to plant a full-blown Moonlight Garden, you can create a little night-time interest in your own backyard space by choosing a few cool plants to light up the night-time landscape. For many, there is no better time to enjoy the outdoors than when the sun begins to set. Temperature and humidity levels begin to fall. There is no risk of being scorched by the sun’s damaging rays. And above all else, it is a time to enjoy the company of friends and family in a relaxed setting, with the worries of a stressful workday put far, far away. So if you are looking to add a little night-time interest, here are three great plant varieties to add to your landscape. 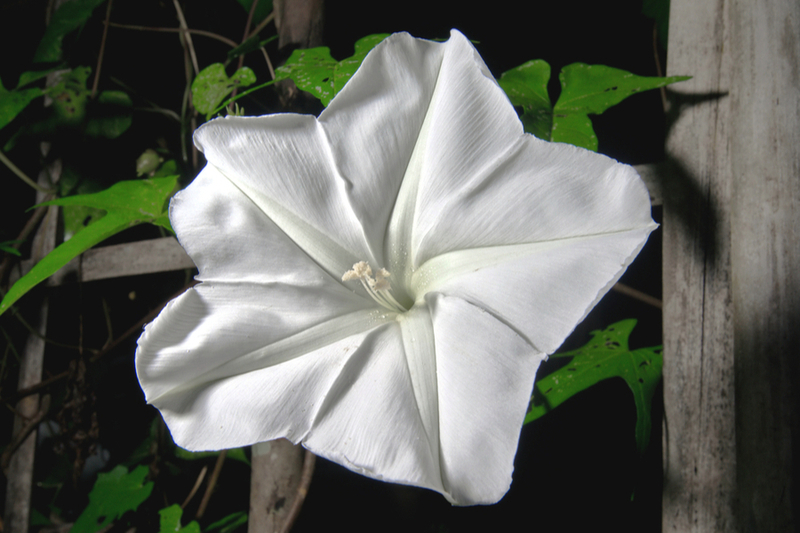 The Moonflower – Perhaps the most well-known of night-blooming plants, the Moonflower (pictured at the top of the article) is the star of the evening garden. Also known as the Devils Trumpet, Moonflowers bloom throughout the dark of night. The soft, pearly flowers expand each evening to reveal a delicate, bright white bloom. As the break of day arrives, the flowers curl back up to wait for darkness once again. Moonflowers are a perennial in tropical areas, but for most climates, they are grown as an annual. One word of caution, the blooms are quite poisonous if consumed. Be sure to use caution when planting if you have pets or small children. The bloom of an Evening Primrose. Evening Primrose – Evening Primrose is an excellent choice to add late afternoon and evening interest to the landscape. As its name implies, it blooms in the evening, long after the heat of the day has passed. The Evening Primrose is actually a native North American wildflower. It has a long history when it comes to herbal medicine. From its leaves, to its oil, Evening Primrose has been used to treat everything from baldness, to headaches, sore throats, bruises and more. Four Oclocks – You know you are special when you are named for blooming at a specific time! And when it comes to Four O’clocks, that is exactly what they do. Well, at least close to that time anyway. 4 O’clocks open up late in the afternoon, and stay blooming all the way til morning. Their brightly colored flowers bloom in the shape of a trumpet. They provide a big burst of yellow, pink, red and white to the overnight landscape. They are highly scented, and their aroma attracts hummingbirds from miles around. So make this the year you add a few night blooming plant to your landscape, and enjoy the evening even more! Share Your Garden And Garden Tips! Want to showcase your backyard garden on This Is My Garden? Then become a contributing editor to This Is My Garden, and share your garden tips or garden story. Email us at info@thisismygarden.com, and you might be our next feature!